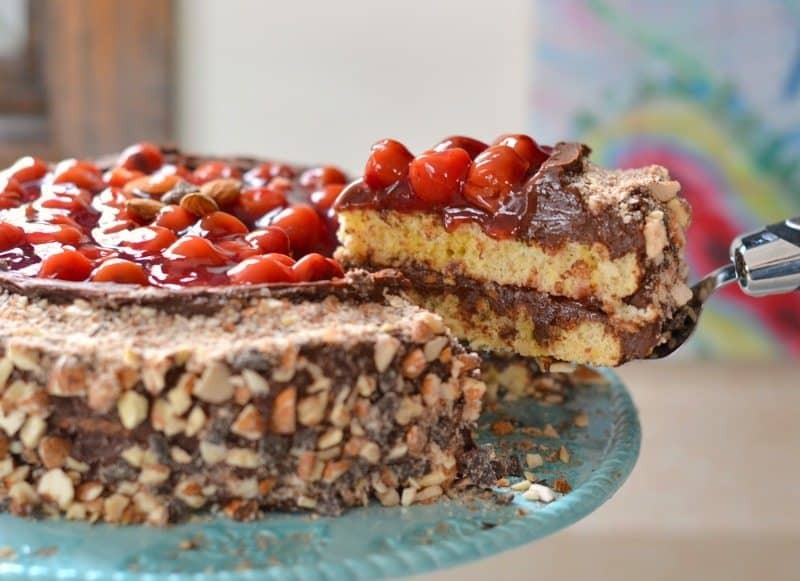 A crispy textured cake with a creamy chocolate frosting and topped with sweet cherries! This Chocolate Cherry Swedish Almond Cake recipe is sponsored by Bob’s Red Mill, created by me, eaten by my family, soon to be loved by you. Find our full disclosure here. This is the cake of your dreams. An utterly delicious, full of flavor, and quite simple to make cake utilizing a Swedish almond cake recipe, simple chocolate butter frosting (you’ll make this again and again! ), and cherry pie filling. These yummy sweet parts squish together to make a Chocolate Cherry Almond cake, the ultimate in desserts, which makes you look like you slaved and slaved for hours. Shhhh, nobody will tell that you finished it in an afternoon. Make this cake in an afternoon while watching Food Network, drink a glass of wine, and chat with your kids. Creating recipes is such a simple memory maker often overlooked, isn’t it? Get into that kitchen, get your apron on, your wine poured, and get this recipe started! Start by separating the egg yolks from the egg whites. Have you ever done this before? Here is a quick tutorial (it’s easy!). Tip: Making this with your kids? Give them a few eggs to try their hand at this. Kids can stay entertained for a long time. Now for the fun part! 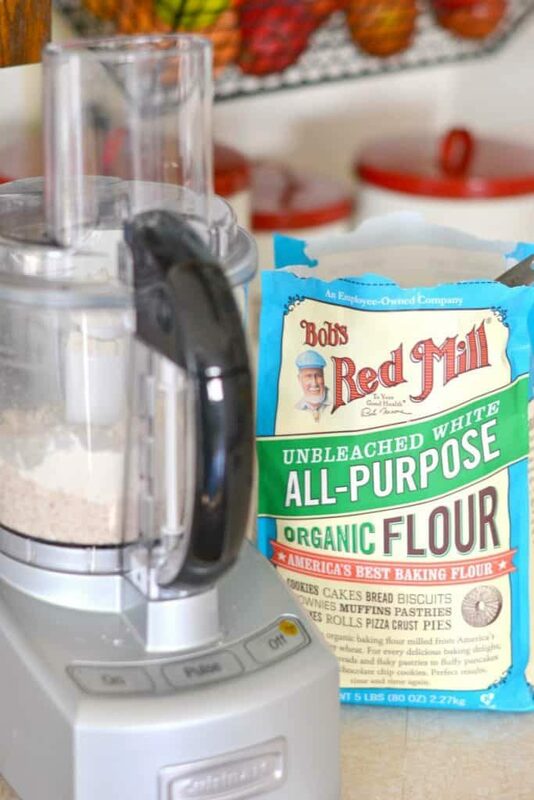 Pull out a food processor, add the whole almonds, salt, and Bob’s Red Mill Organic Unbleached White Flour. Use good quality flour like Bob’s and grind the whole almonds yourself, this is the key to this great-tasting cake and a great way to show kids more skills and variety in the kitchen keeping them interested in where food comes from. Bob’s is freshly milled from organic hard red wheat. It isn’t enriched with any additives and is the same high protein flour used by professional bakers. But, you and I can easily find! Truly, I use Bob’s Red Mill products exclusively in my own home. Tip: Adding ingredients through the chute and pushing the pulse button on the food processor are favorites for kids. Let them help with this step. 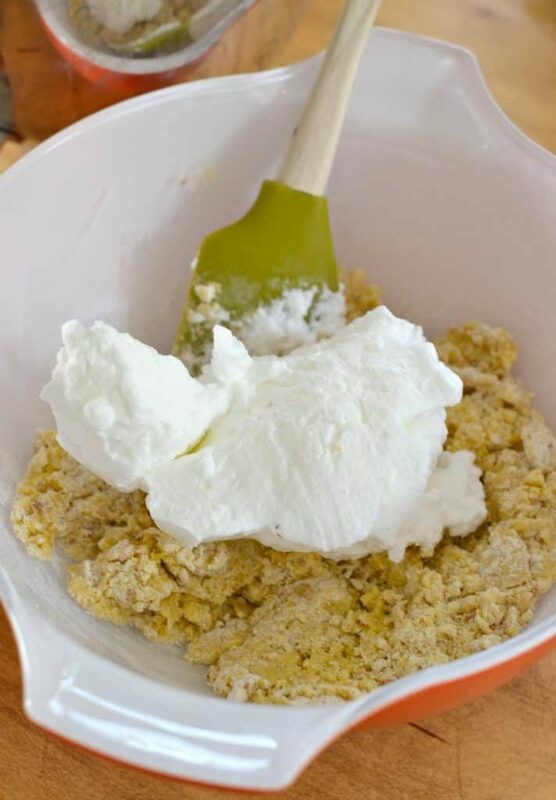 When you mix the flour mixture with the egg yolks, you will find it quite stiff and be tempted to over-work it and mix and mix. Remember, don’t do it! See in the picture above what it looks like? It is stiff, too. No worries…it will work! Tip: Ask your kids if they know why you shouldn’t overwork gluten. Science! After you get your egg whites whipped up (need a reminder or instruction on this head HERE for a quick refresher), add about 1/3 of the egg whites to the flour and yolk mixture. Next, gently work it into the flour mixture. 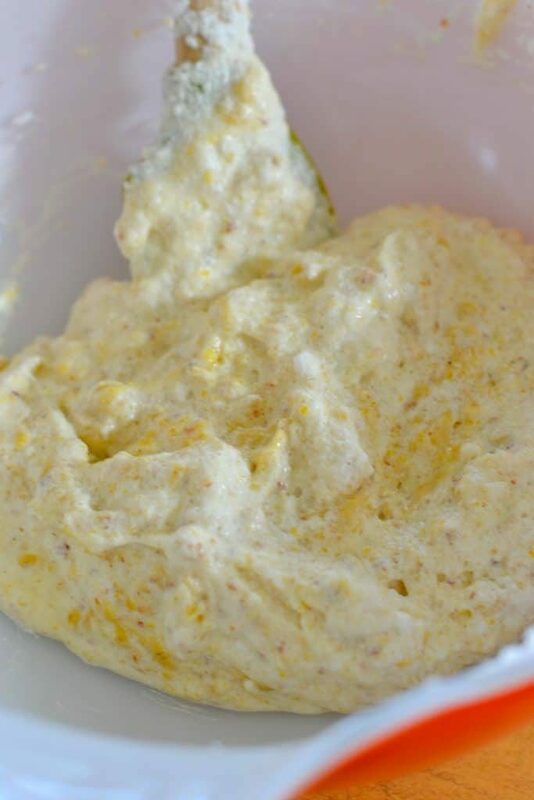 This will help loosen up the dough and prepare it for the rest of the egg whites. Don’t over-think this. It truly is a bit strange. After gently folding in the rest of those egg whites, you will end up with a batter that looks something like what you see in the above picture. But why would you need to add the egg whites in the batter in such an odd way, you wonder? Because it creates a wonderfully crisp and sweet dough without the need for a lot of sugar. The Swedish love baking without a lot of sweetness. This cake is a good example of how utilizing different techniques allows them to avoid the addition of sugar. Stop! Let’s chat right here. Skip the layer cake with absolutely no harm to the flavor. None! Use a round 9-inch pan and bake for about 25 minutes (instead of 15 minutes). Frost and top with cherries. Faster and absolutely just as delicious! Promise. Just lick that screen, already. 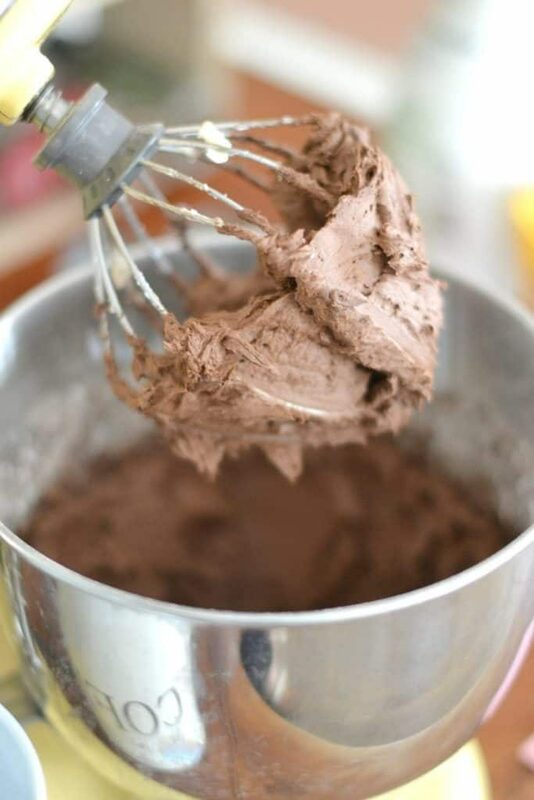 This frosting is a go-to frosting used in some variation in a good portion of my cakes and cookies. This variation contains less sugar and far more cocoa to keep it dark and creamy. In honor of the Swedish, the frosting isn’t particularly sweet. You can adjust that sugar, cocoa, and butter amounts to create your favorite combo. Tip: Give the kids the bowl and beaters and you won’t see their faces for minutes. Be sure to grab pics! 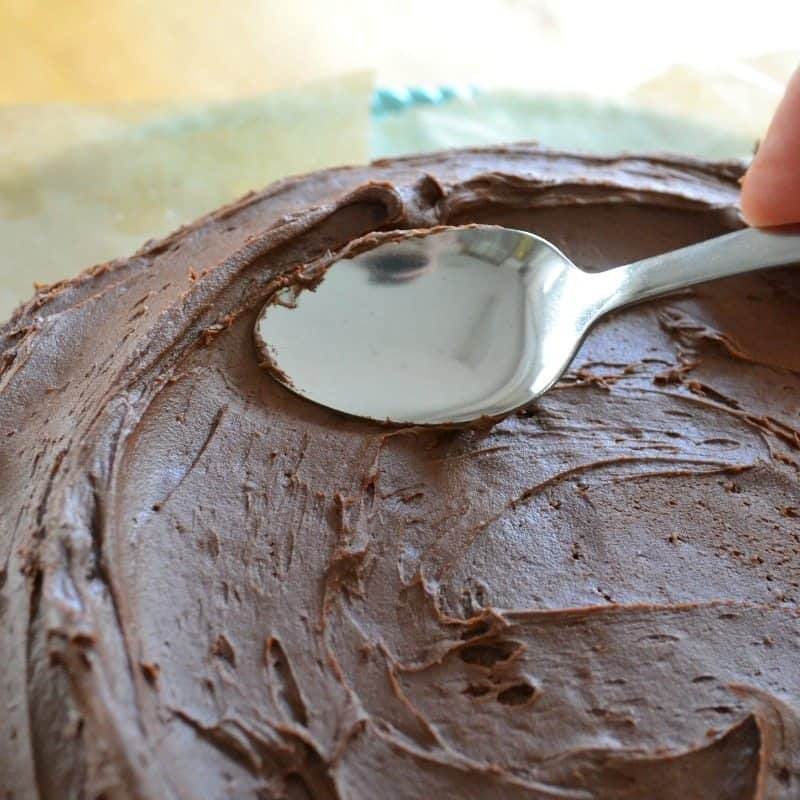 Create a well on your cake to hold the cherries by simply adding a large scoop of frosting to the center of the cake, frosting it like normal, add another scoop of frosting to the center, and gently use the back of a spoon to push the frosting from the center to the sides. Create a bit of a ridge, as you go. Inside that divet you can add your cherries. I prefer to use an organic, local brand of canned cherries. Tip: if you have canned cherries give them a quick rinse in a colander to take down some of the icky sweetness. Be sure to let that drain well before putting on your cake. 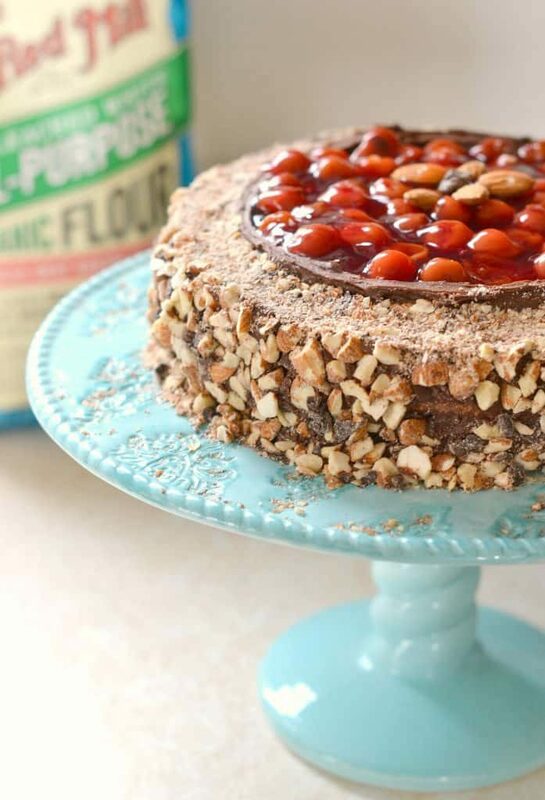 There are pressed crushed almonds around the sides of this Chocolate Cherry Almond Cake. Tip: if making a simple one-layer cake, sprinkle the crushed almonds around the cherries. You could do this BEFORE putting on the cherries and use them to contain the cherries. Easy! The Swedish almond cake is amazing with a crisp texture, sugary edges, and gentle almond flavor! Top it with the creamy chocolate frosting and sweet cherries for a winning cake recipe that people will ask you for again and again. 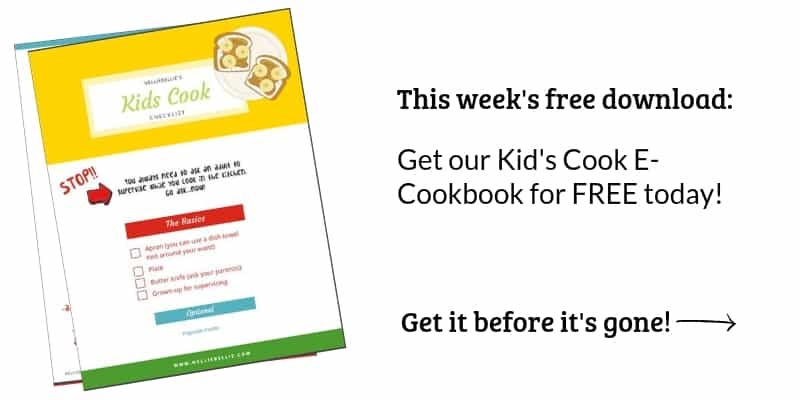 Bake this up with your kids for a wonderful afternoon full of memories and tasty treats. Before you’ve even finished the cake :). Busy moms need every opportunity to enjoy pretty things while creating memories. Why not create a pretty, TASTY thing and create memories? Grind the almonds, baking powder, and flour in food processor. 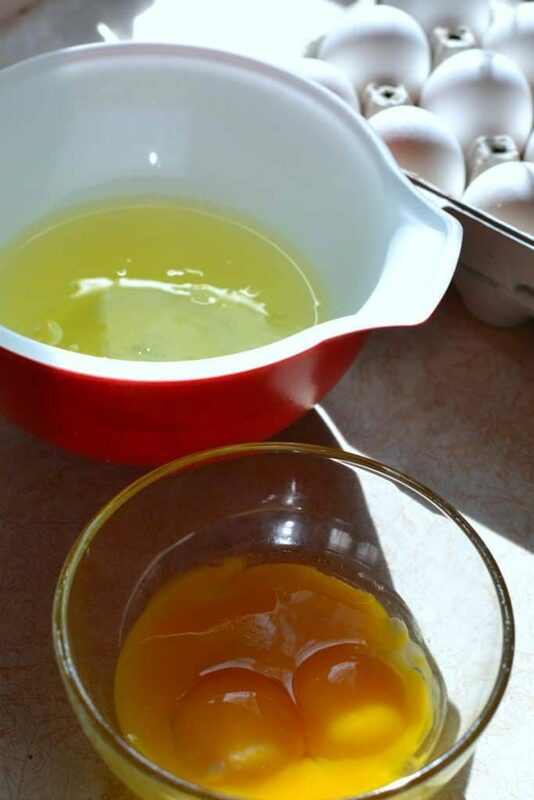 In large bowl whip the egg yolks, sugar, and almond extract together. Add the flour mixture and stir gently just until blended. Do not overmix. 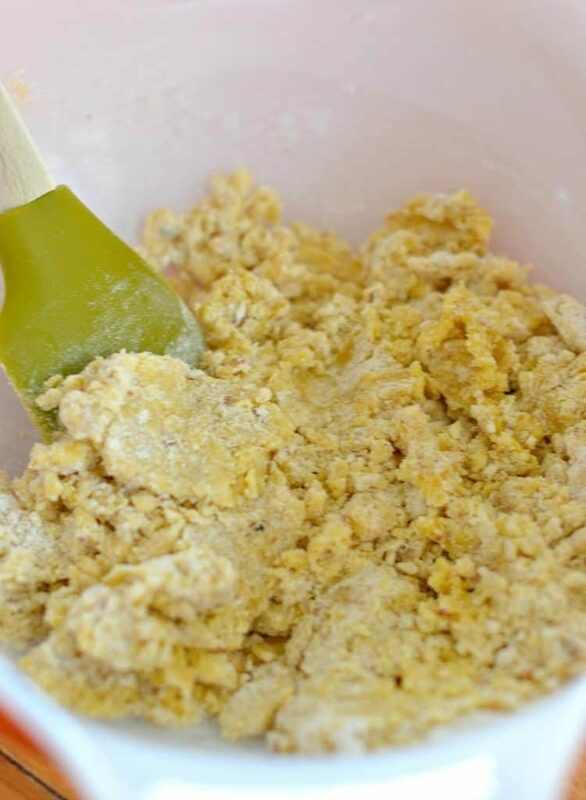 Gently stir 1/3 of the egg white into the yolk and flour mixture until the mixture is softened. Fold the remaining egg white into the mixture. Gently fold until the flour/yolk is mostly worked into the egg whites. This can take a few minutes. Be patient. Pour into cake pan (s) that have been sprayed and sugared (see notes below) and bake for 20-25 minutes at 350 degrees until edges are set. Beat the butter, cocoa, sugar, and extract together. Top the cake with the frosting and add as many cherries as you prefer. Pour 1 tablespoon of sugar into an 8-inch round cake pan and tap around the pan until it covers the bottom and up the edges. Read the above post for tips, tricks, and notes! This Chocolate Cherry Almond cake recipe was sponsored by Bob’s Red Mill. We know you will love their products and are proud to recommend them to our readers.